The valve controller provides two bidirectional outputs from -400 mA to +400 mA for servo valve and other actuator applications. Two signal outputs are also provided for feedback to a PLC or other device. 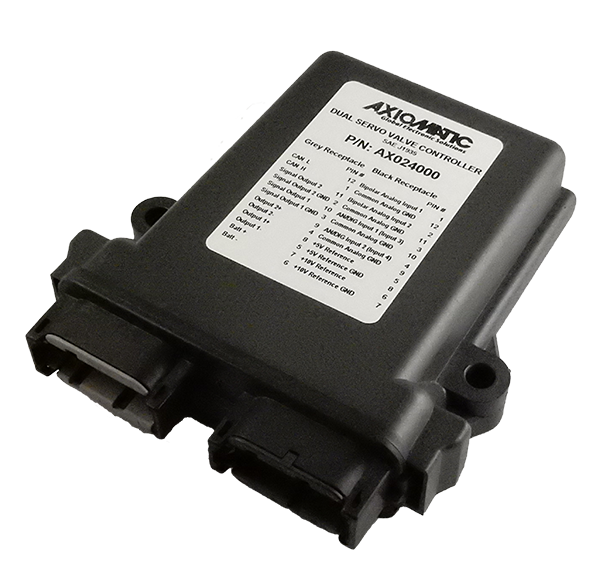 An isolated SAE J1939 port is provided for machine networking. . The firmware was developed used Simulink®. Two analog signal inputs are selectable as the voltage or current signals. Two analog/digital inputs are available as voltage, current, PWM, frequency or digital signals. Two reference voltages are available to power sensors. A rugged power supply interface accepts 8-36Vdc and is appropriate for battery powered machine applications. It is ruggedly packaged for installation in wet, humid and dusty environments.